The other day, my friend and I went on a little fact finding trip to a 'major gaming store' (to keep them anonymous well just call them GW). The goal of this trip was to try out the new paint line. I was looking forward to the new colours and technical paint medium. The new line is very good. They are certainly up to the medium to excellent standards of GW's old line. GW even add some nice mid tones to their already excellent line of shades (washes, Inks). Although the new inks are simply two of the old inks mixed to create a 'new' colour (if you add Baal red to Devlan mud you get Carroburg Crimson). My only real problem with the new line of layers (regular paints) is; they all seem to be muted or duller than other companies paints (Vallejo or PP). The reason for this (as it was explained to me) is the new paints are designed with the new system. So you need a few other stages to pop the colour back to a 'full depth'. The new white and black base paints are very good, and i love the technical medium (insert evil laugh here), so many plans for that...but i i'll save that for a later article. First thing i did was rub some between my fingers to see what its made of. from what i can tell its just a quarter bottle of green or brown paint with a table spoon of clear silica sand. I estimate you could paint roughly 20 models from one jar. Or you could hug your wallet and glue the sand on then paint it. This method gives you about 200 models from one jar. I'll leave the decision up to you, the reader. If you really have to put your sand in the paint just remember to use a very fine grit 'clear' silica sand. If you don't use a clear the colour of the sand will alter the shade of the paint (too a small degree). You can get the sand at any Michaels or your local art supply store. Leaving with a lighter wallet and mixed feelings, we headed straight for some local retailers that still had the old stock of paints (picture the shelves of a 1980's east German toilet paper store). 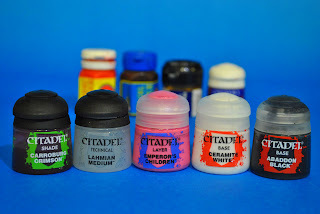 I managed to buy a near lifetime supply of some colours I have already used on my main armies (yeah I'm looking at you Orks). This way i can add to and finish them without having to worry about losing uniformity. I hope you could take something away from this article you can use. See you soon in the 4x8 arena.